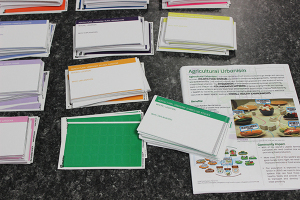 A new Agricultural Urbanism Toolkit produced by the Iowa State University’s Community Design Lab offers communities the planning tools necessary to prioritize and ignite urban farming projects. Created with the support of a grant from the Leopold Center for Sustainable Agriculture, the Toolkit includes process, practice and case studies to help jump-start local urban agriculture programs. Courtney Long is a fellow for the Community Design Lab and facilitator of the urbanism toolkit program. “The toolkit is actually twofold. It’s a process that we go through with communities, and it’s also a research booklet on tactics of agricultural urbanism,” she says. The program was beta-tested with three different communities: a rural town, a neighborhood network and an urban coalition. The communities were selected based on letters of support and letters of interest and include the City of Des Moines, Cedar Rapids and Cresco, Iowa. The Toolkit offers tactics used to develop and build local food systems, including community supported agriculture, edible landscaping, community and faith gardens, food hubs, urban farms, farmers’ markets, commercial kitchens and sustainable business development. How tactics apply to each community is determined through meetings designed to move each community through the process of identifying their needs and implementation opportunities. Cedar Rapids chose to capitalize on their established city food plan. Cresco felt their niche was the ability to grow local food year-round, while Des Moines chose to focus on strengthening established projects within a municipal network. The second phase of the process includes assessing the current infrastructure; what is available in terms of space and resources in a given community. Behind the scenes, Design Lab staff interview local food system workers to build data on needs and resources in the communities, as well as case studies of local projects. A third meeting receives community input with an open house, giving local residents a chance to be a part of the process. “The open house was offered in the fall of 2014. Essentially we had all of the tactics on posters in a semicircle around the room where individuals could come in and read about each tactic. There were color-coded stickers and they could stick what they believed should happen in their community on a nine foot by nine foot map,” says Long. 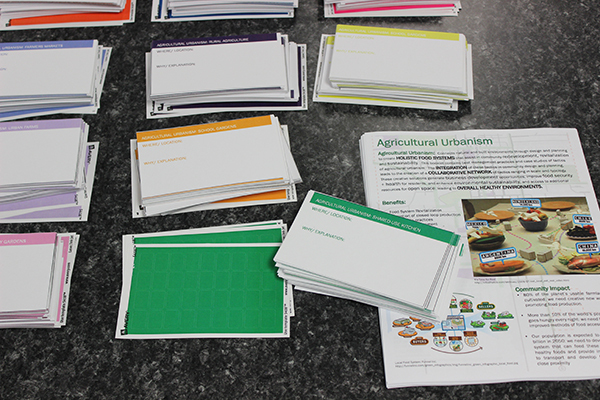 The stickers were reinforced with color-coded postcards that gave residents a chance to better explain their choices. The postcards helped the Community Design Lab focus efforts within each community balancing resources with public opinion. Finally, the fourth and last phase includes prioritizing tactics and creating a written report and plan for implementation. In December of last year, the Community Design Lab presented all their findings to the steering committee of each community. “At the end of the meeting we had four to five priority tactics for implementation for each community,” says Long. The goal is to implement the tactics within two years. Priority tactics included a shared-use kitchen, a community awareness campaign and expanding a local farm and a greenhouse analysis study. Planning was divided into short-term and long-term priorities, and the Community Design Lab will help communities with designing and implementing each project. Long says the Toolkit provides a template for any community to not only “start the conversation” but also to move words into action through design and implementation. The Design Lab has received additional grant funding to work with three new communities in 2015, while moving the first set of communities into a second-year implementation phase.